Reminds me of the first time I launched my paradox. To avoid pressure from others at the ramp I chose not only a week day but arrived at about 4:00am in the dark. Had the ramp entirely to myself for the whole time. And now for some odds and ends! 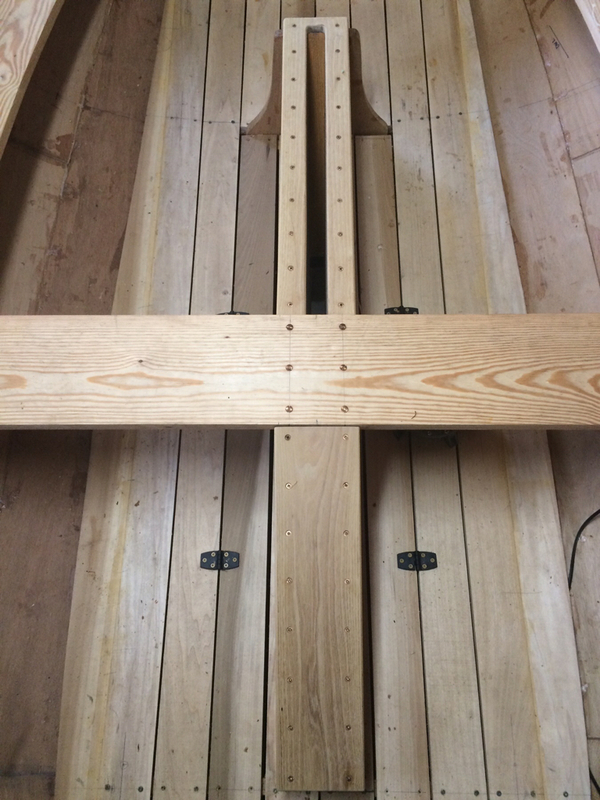 I want to start making spars in between other jobs on the boat. 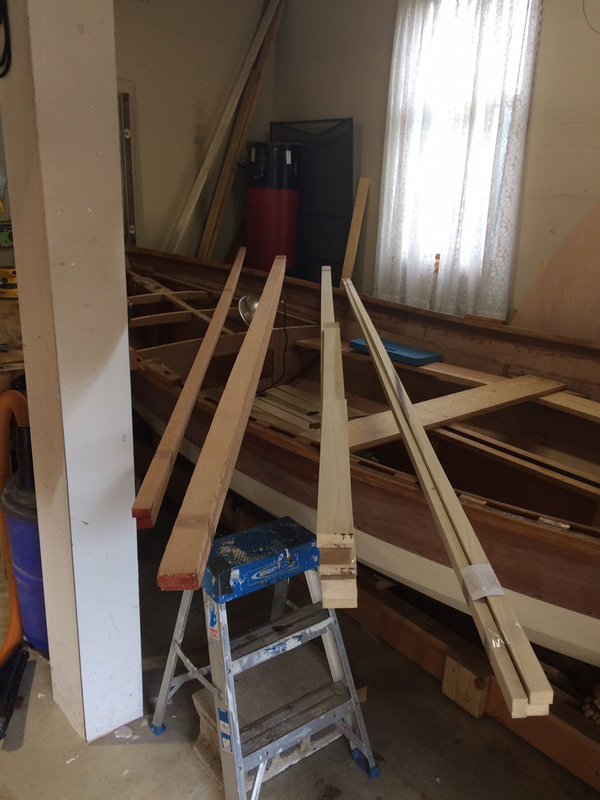 I have both the main and mizzenmast provided by Pilotarix (Chris) and have just enough Doug fir for the boom and bumpkin/boomkin but will need to purchase wood for the lug yard and sprit boom. I briefly looked into Sitka spruce but the cost/benefit ratio is more than questionable. 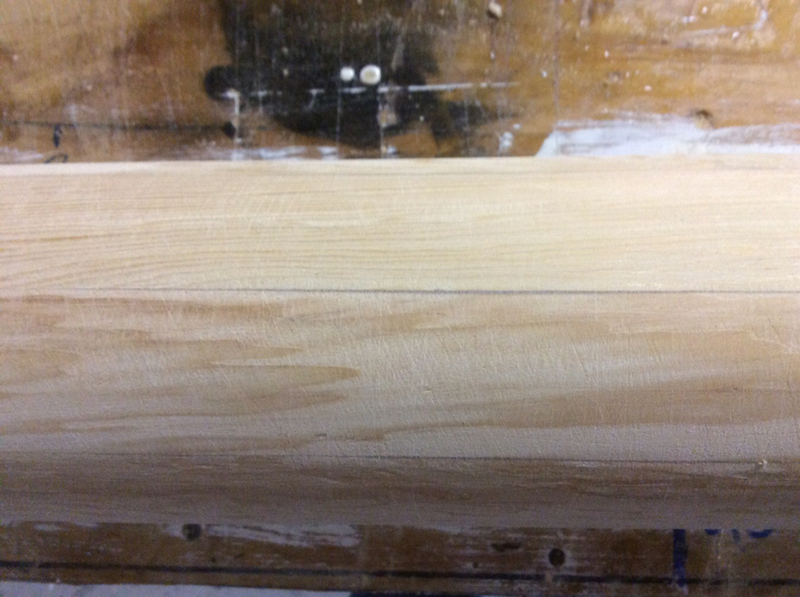 A survey of wood characteristics finds that poplar has very similar qualities to Sitka and here in central NJ is available in good straight, clear lengths at moderate prices. For these reasons I posted the question Alternatives to Sitka for Spars in Tools/Materials/Techniques/Products. Many stated doug fir but it is not as easily available in good clear lengths around here and is heavier and more expensive than poplar. 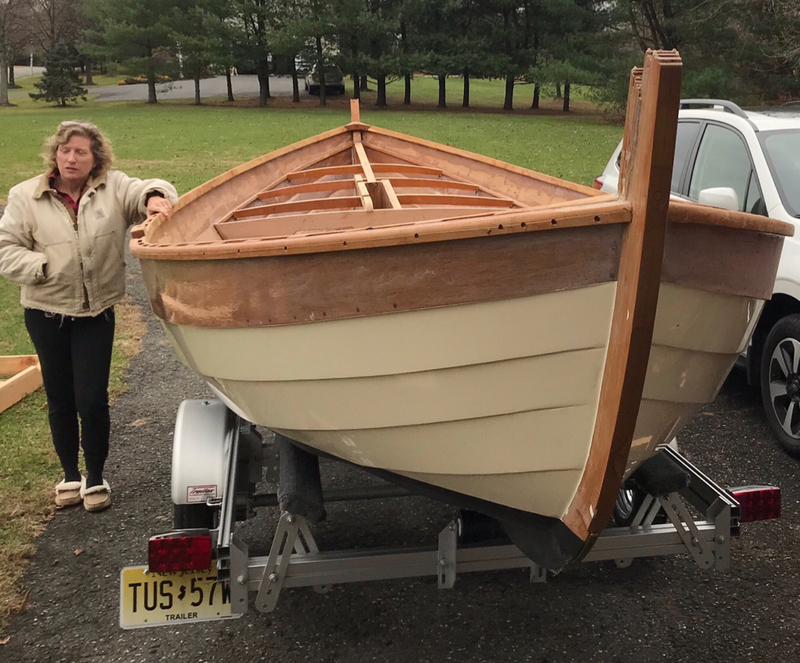 One central Atlantic boat builder, Dave Gentry provided the answer I hoped to read, ”I've made a number of small boat spars out of poplar, and I like it. It's as close to Sitka that I can get around here - and it is very close. I try not to leave my spars laying on the ground, and haven't had any rot issues in the last five or six years. Not even on the two that I left out, uncovered, for two of those years. 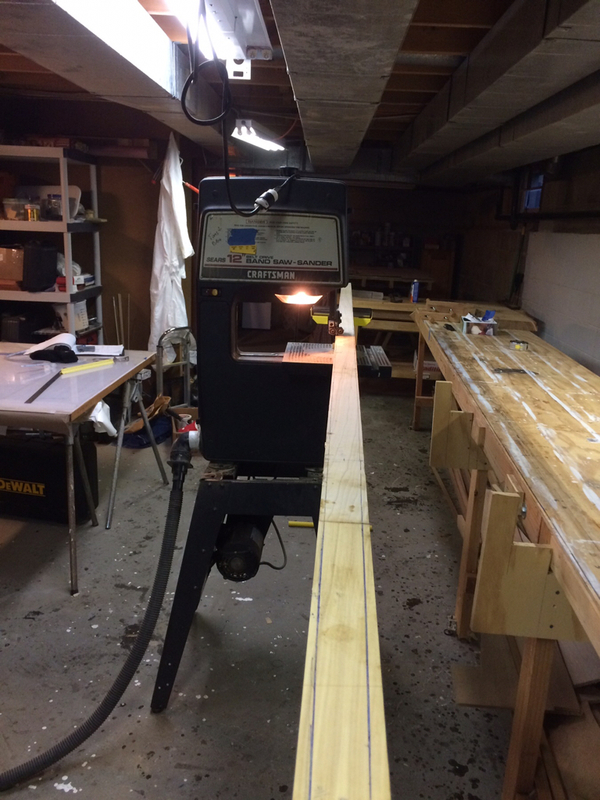 Dudley Dix specifies poplar and cedar for the mast of his Paperjet, btw. He lives not so far from me, and likely has the same issues acquiring good lumber. So, my yard and sprit boom will be poplar. 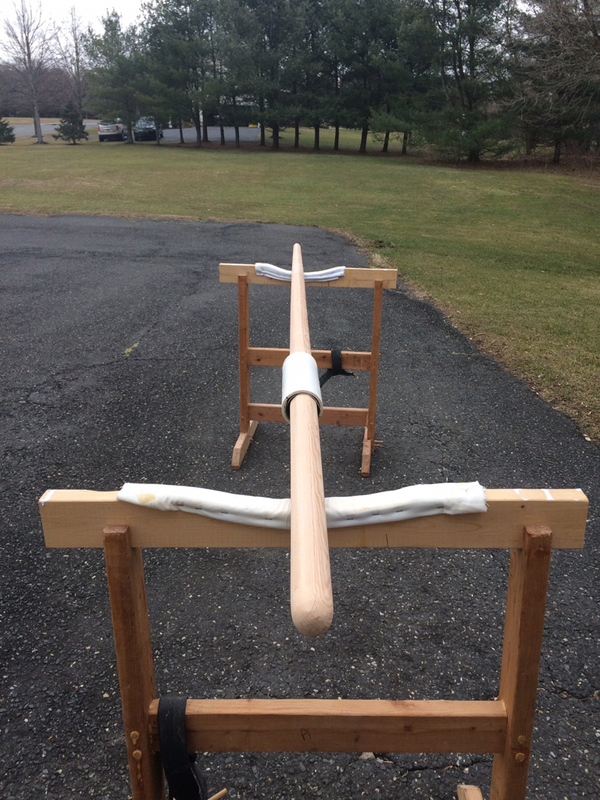 So I spent a little time ripping the pieces required for gluing up the blanks for my spars. Boom and boomkin are doug fir and yard and sprit boom are poplar. On another issue Hamilton Marine was having a sale on rope available in good sized hanks. 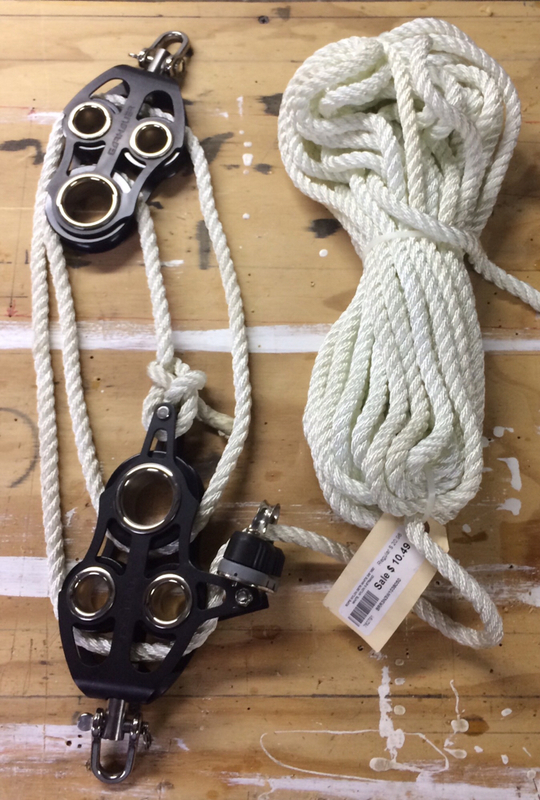 So I now have 3/8 dyneema for the lug halyard and down haul, 1/4” for lacing on the sails and for the reefing lines and 3/8” nylon for the lug sheet. Those fiddle blocks were a gift from my wonderful wife. My final item is the result of trailer quest. I have been searching for a used trailer but the only size appropriate used trailers I could find were at the end of their life cycle. Next I tried for a new galvanized trailer but no luck locally. Then there was the direct to the manufacturer approach. That got me the typical “not interested” reply and one quote for a trailer weighing 1500 lb and a 3500 lb GVW. I interpreted this as a not interested. Finally I found a new aluminum trailer weighing 250lb with a 900 lb capacity. The trailer budget exploded but it was the best option. This will come home next week. Last edited by Steamboat; 11-03-2018 at 09:31 AM. Nice find with the dyneema. If you have any to spare, make up some soft shackles. 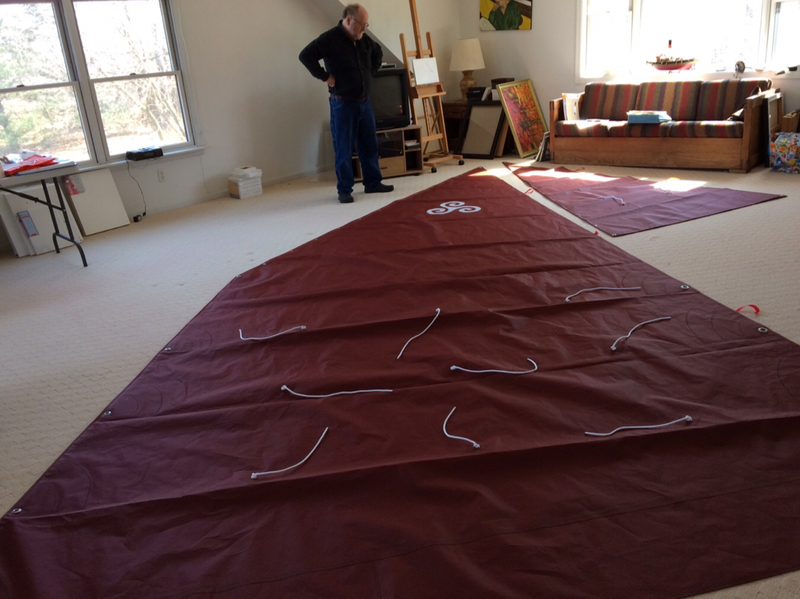 Good suggestion and there should be some left from the halyard and down haul. There are several places where soft shackles are going to be used on the boat. Last edited by Steamboat; 11-03-2018 at 11:10 AM. See this current thread for ideas for guide rollers and bunk height for your lovely new trailer. I’ve been following with interest. It is clear that some sort of guide system will need to be added. So the trailer cam home and then there was Thanksgiving. 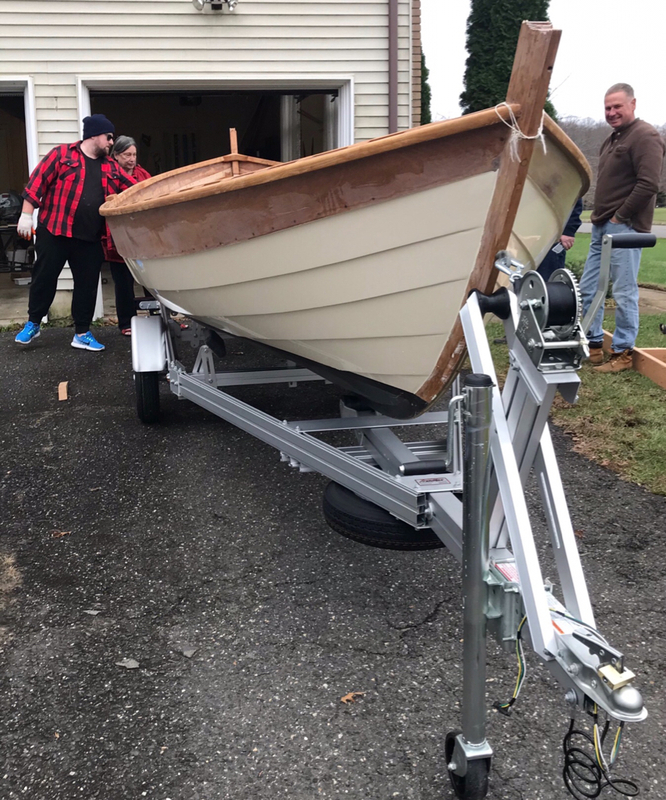 Thanksgiving meant my son and his girlfriend came and he would help me get the boat on the trailer. 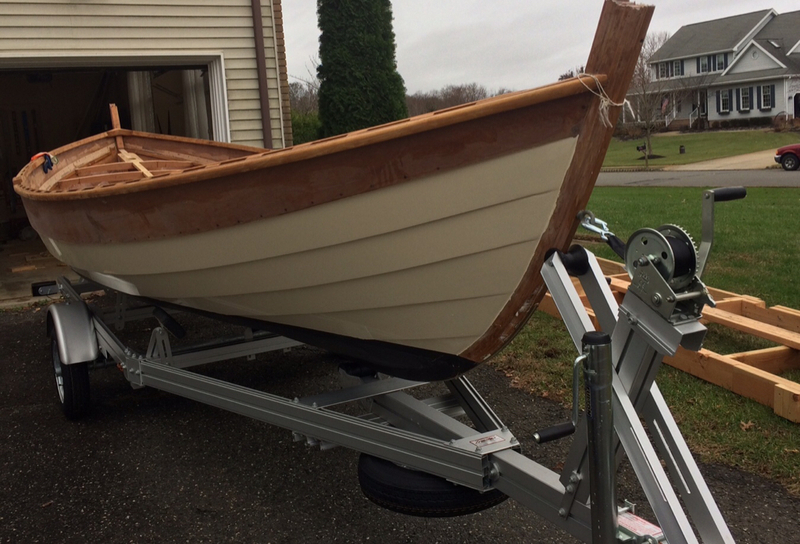 It went very easy, like it was designed for the boat, THANK YOU TRAILEX! 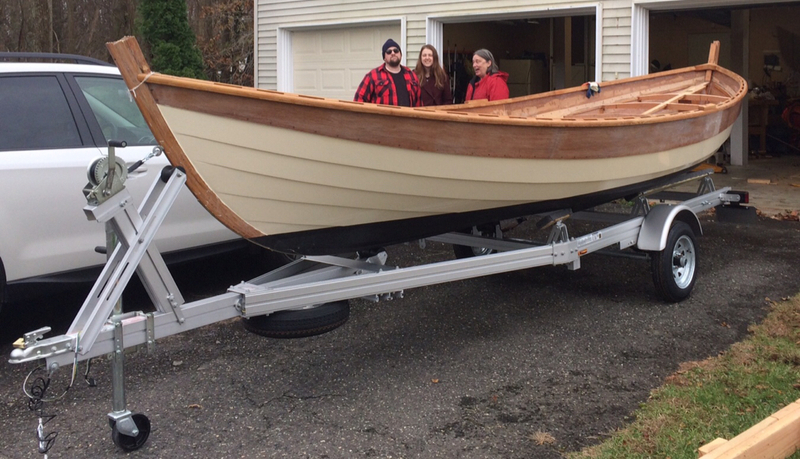 My wife, son & his girlfriend pretending to admire the boat! Ok, looking at this, it is past time to trim the stems. 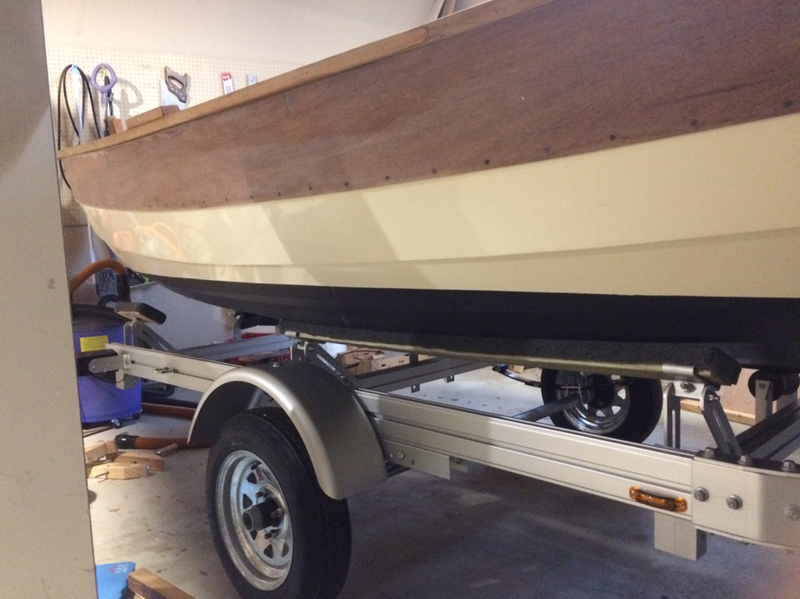 Since my last post on putting the boat on trailer I spent a little time adjusting the rollers and bunks so that the weight on the rollers is distributed as evenly as possible and the bunks just kept the boat upright. 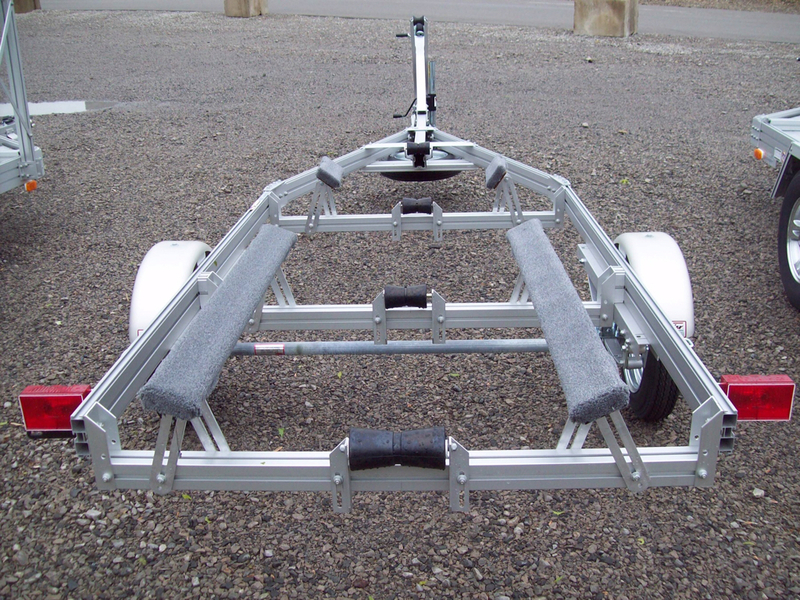 This required rolling around on a creeper under the boat and adjusting the height of the rollers. 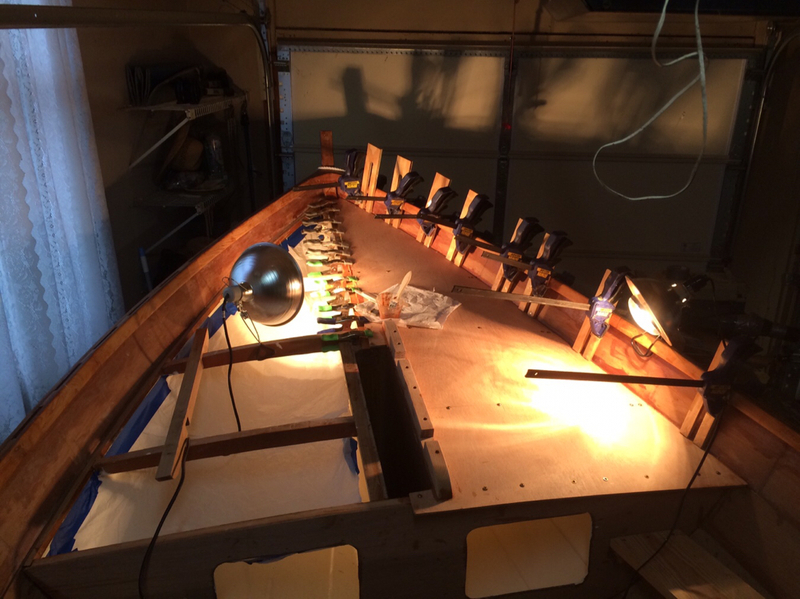 Happily the one roller under the centerboard trunk sits under the last six inches of the centerboard. If the pendant breaks the centerboard will still stay off the road. The bunk setup needed to be modified. In the first picture you can see the small forward bunk did not make any contact with the boat and the longer bunk on the aft end did not support the boat amidships. These bunks were repositioned. In the second picture you can see the long bunks now support the boat amidships and contact the boat just outside the bilge runners. 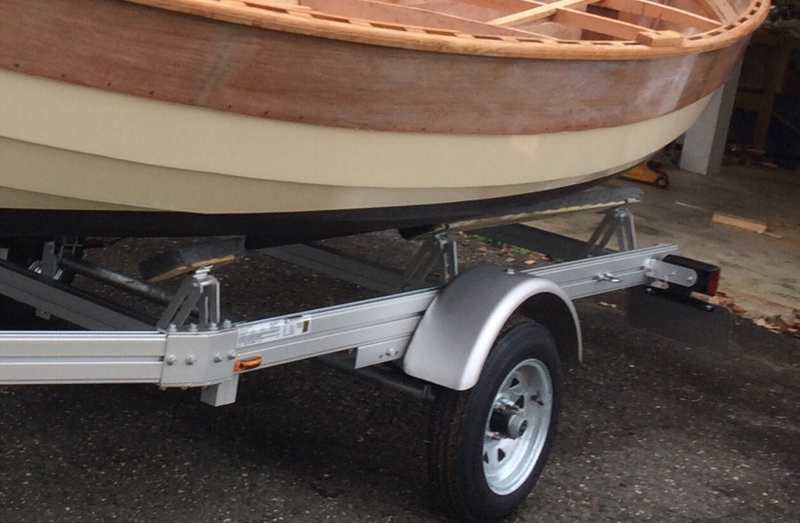 The small bunk were moved to the end of the trailer where I hope they will help guide the boat when loading. One final item. 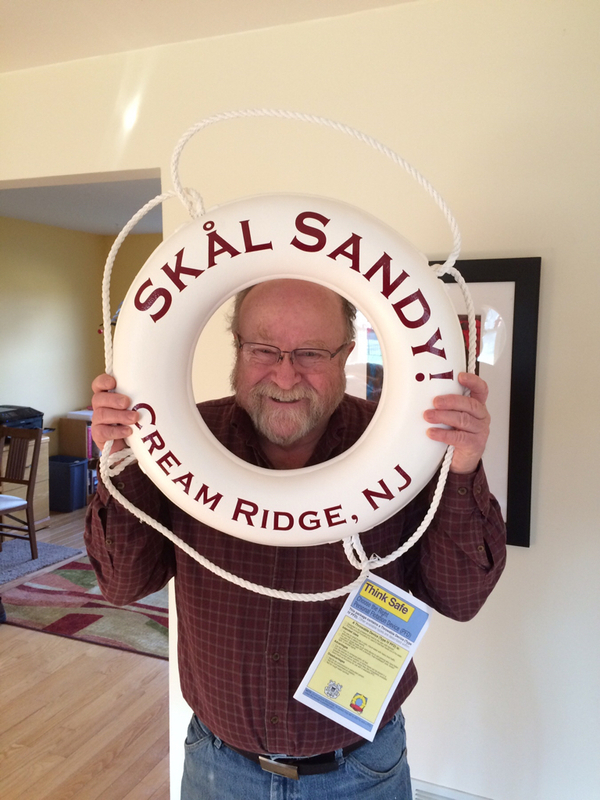 My son and his girlfriend thought the boat needed a personalized Type IV PFD So they gave me on for Christmas. What a nice gift! 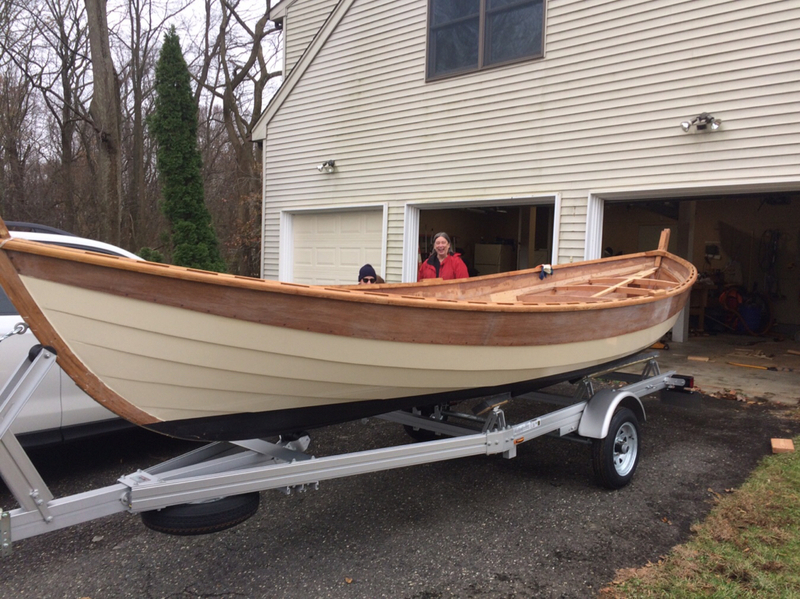 Boat looks great! Planing to eight sided. My spar gage is not a thing of beauty but it works. The barrels of the bic pens are set tight and do not slip but they can’t be removed. If the pen tip breaks or stops working the tip and ink tube can be pulled out and replaced with a new insert. This is the yard being cut to width. Used a power plane to rough out to eight sided but when I got close to size I used hand planes. Once the yard was somewhere beyond 16 sided it was time for sandpaper. 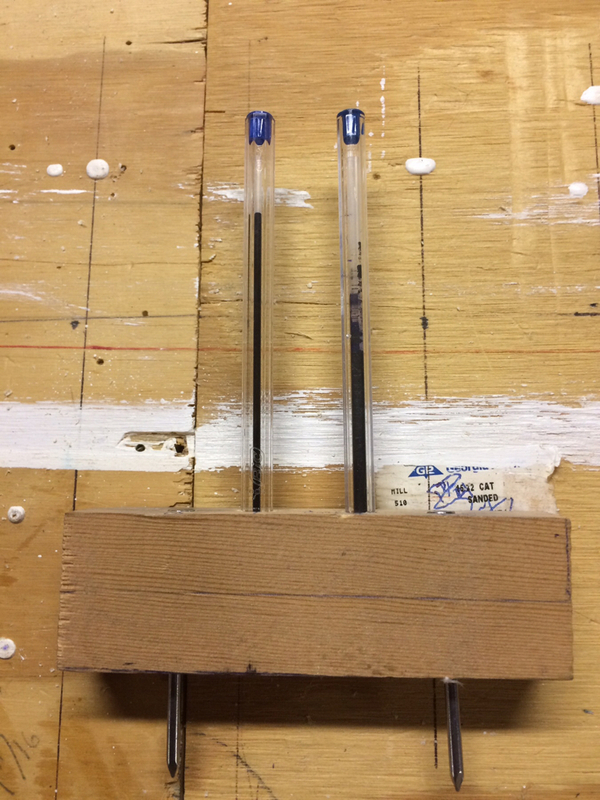 The sanding tool is 3 inch pvc with long strips of sandpaper with hook and loop backing. The pipe has hook and loop tabs in both ends. Peter Sibley uses the saying perfect is the enemy of good but for my yard good is the enemy of mediocre. Last edited by Steamboat; 02-07-2019 at 11:52 PM. Practice makes for improvement, the boom escaped being mediocre. We had a brief burst of warm weather and I got a coat of paint into the forward flotation chamber. 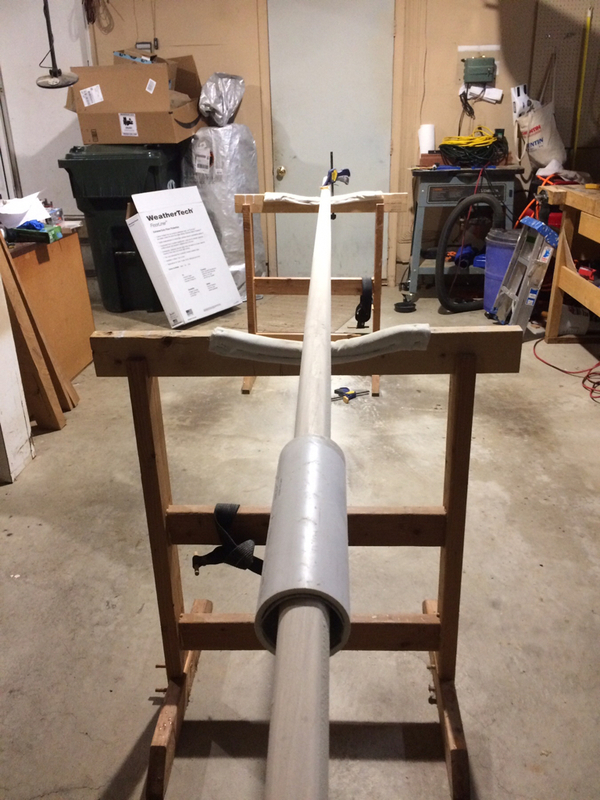 Started working on the mast from Pilotarix’s (Chris) build that he terminated when he purchased a CY and went sailing. Chris had just started to shape the mast when He gave the mast to me. This was its status then. After a bit of work with a plane and some energetic work with a big sanding belt it now looks like this. 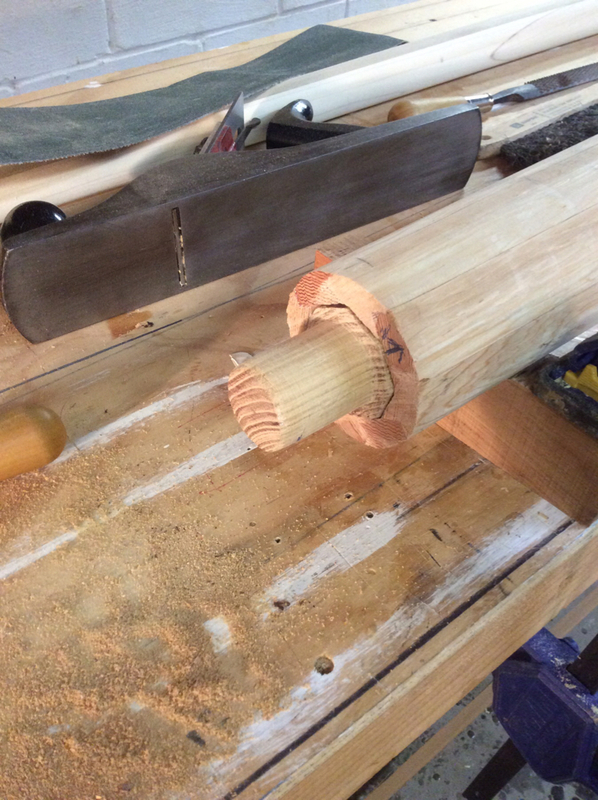 The next step was to make a black locust plug with a tenon to fit the mast step. 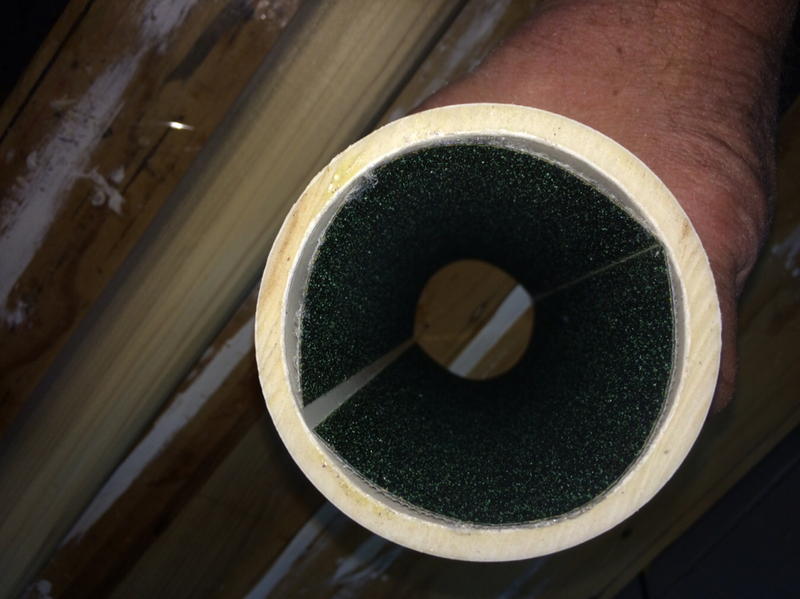 An 8” long octagonal plug was fitted to the mast and then a round tenon was cut that is 1-3/4” long and 1.42” to 1.45” in diameter. The tenon inserts nicely into the 1.5” diameter socket in the mast step. 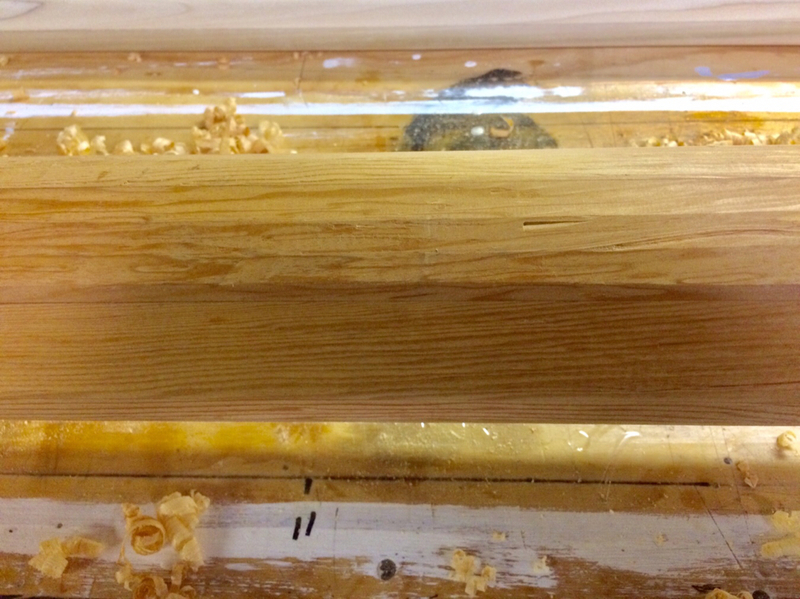 No lathe, so the tenon was cut by hand. 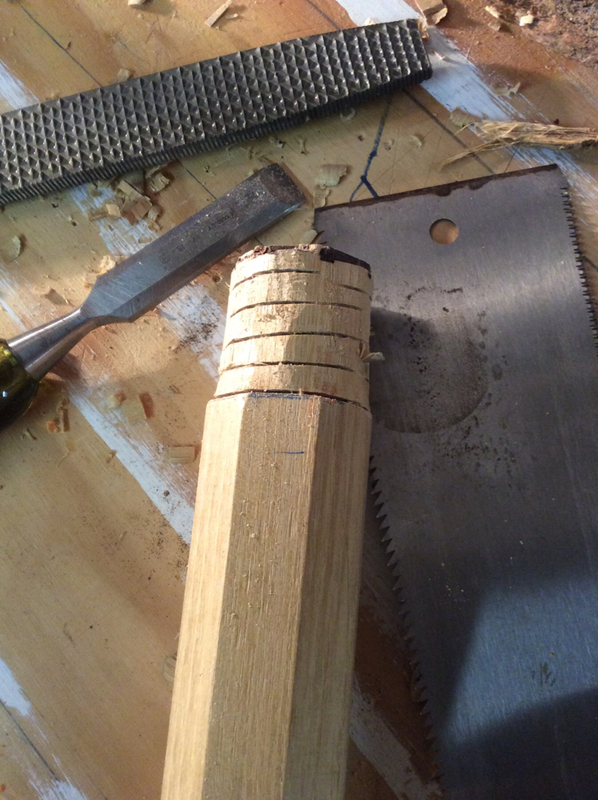 A 3/16” deep spiral cut was made from the base of the tenon to the end and cleaned up with a chisel and a rasp. Not 100% round but the best I could do. Last edited by Steamboat; 02-19-2019 at 05:34 PM. We’ve had a few periodic warmish days which made it possible to get a second coat of paint in the forward chamber. 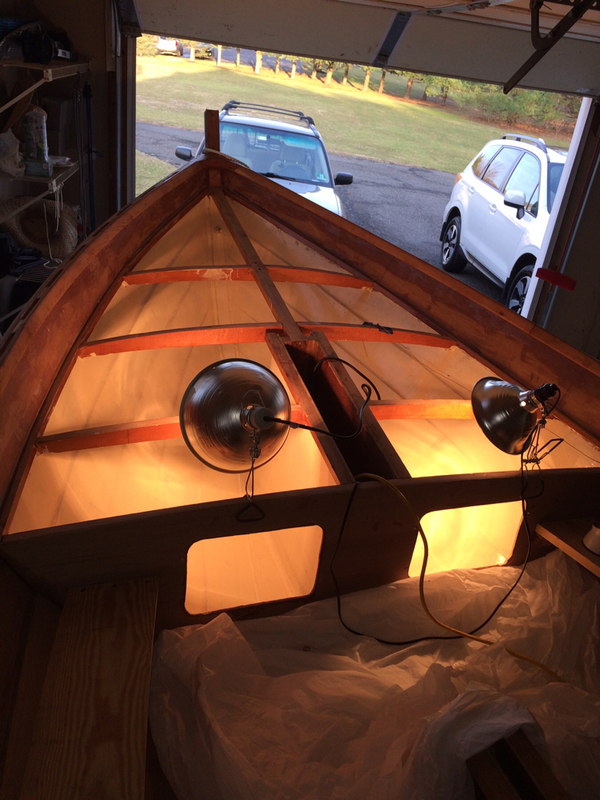 Once that had a few days to dry it was time to glue the first half of the foredeck in and install the starboard mast chock. Will try to do the second half once we get another warm day. The infrared lamps mess with my iPhone’s exposure and color rendition. It was much brighter in the garage than it appears in the photo. Thanks for posting on our Tom Cat Builds! Hope you are coming along on you Caledonia... 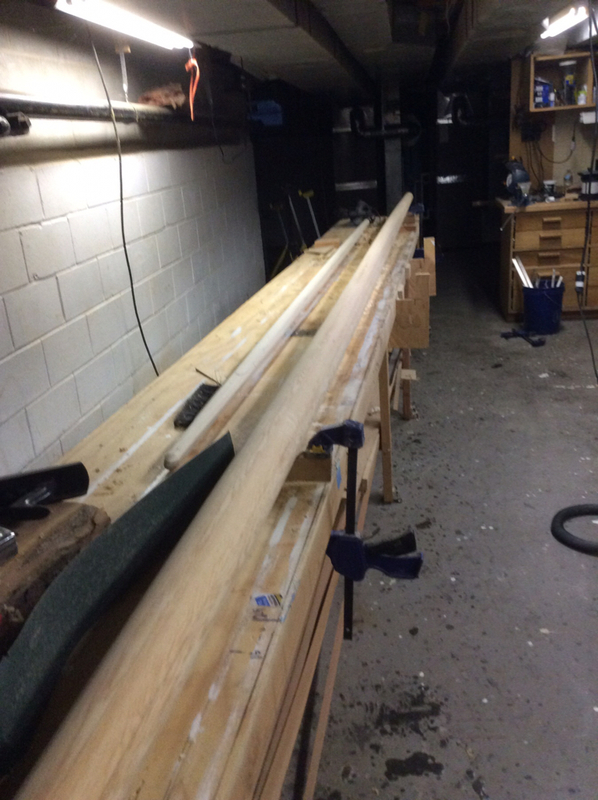 I am interested to know about the small lumber source you had for the BL as I need some white oak for rub rails, coaming and toe rails. Do you have a contact? Greg, There is a small sawmill in Glen Gardener, Hunterdon County, NJ that had a good supply of air dried black locust. 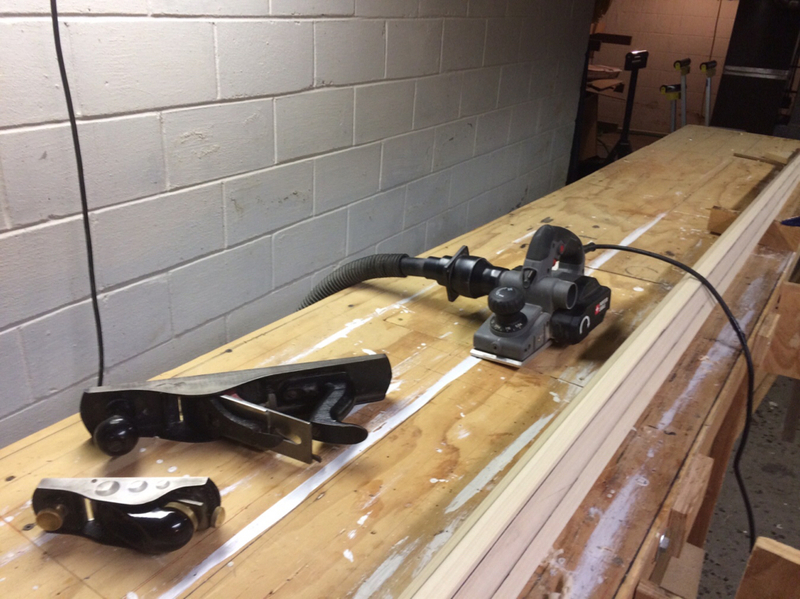 Bought five boards of 5/4” X 5 -6” X10’ and one 8/4” X 6-1/2” X 10’. The boards are straight , flat and essentially defect free. The 8/4” was in the shed for 5-years and the 5/4 was in the shed for 2-years. The sawyer had quite a good stock of white oak and cedar as well. All lumber was in long narrow drying sheds - neatly stacked and stickered If anyone is interested the phone number is (908) 217-6105 and purchasing is by appointment only. Last time I was there was 2013 so they may be gone. You could try Willardin Hamilton NJ which is where I had my BL logs slashed. I’ll check on a local sawyer in New Egypt to get you their contact info. Last edited by Steamboat; 02-25-2019 at 12:36 PM. Subscribing here , for pleasure of nice building. "Mediocre" made me laugh, thanks for that ! I had not considered Poplar for my project at all. There is a good selection of clear stock in one of the local yards for a reasonable price...You give me another possibility to add to the kiln dried Douglas fir or green standing spruce (the cheapest option). Love your work! L’Ankou, Greg & lclavake, thanks for the positive comments! May we know the maker of these gorgeous things ? Well, today is a special day, these arrived this morning! 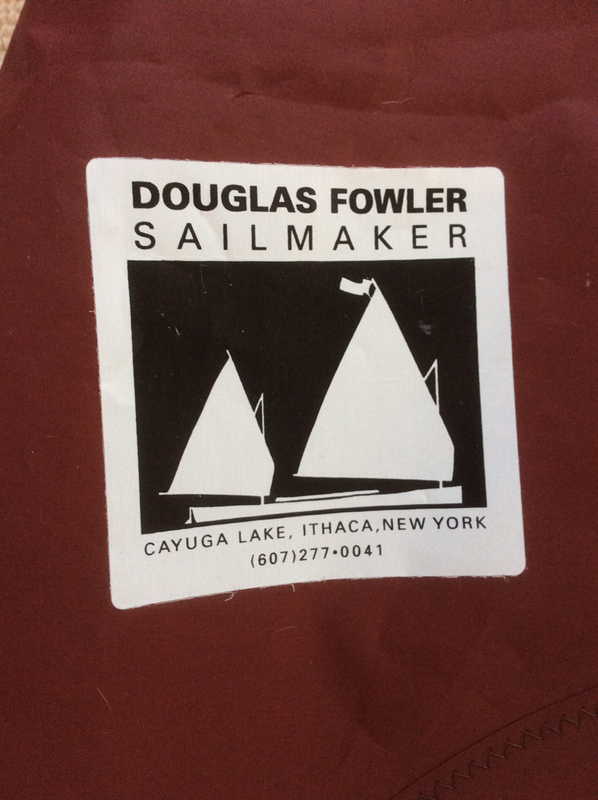 They are made by Douglas Fowler and to me they are beautiful! We go splash some time late spring/summer! Nice trad sails as well ! 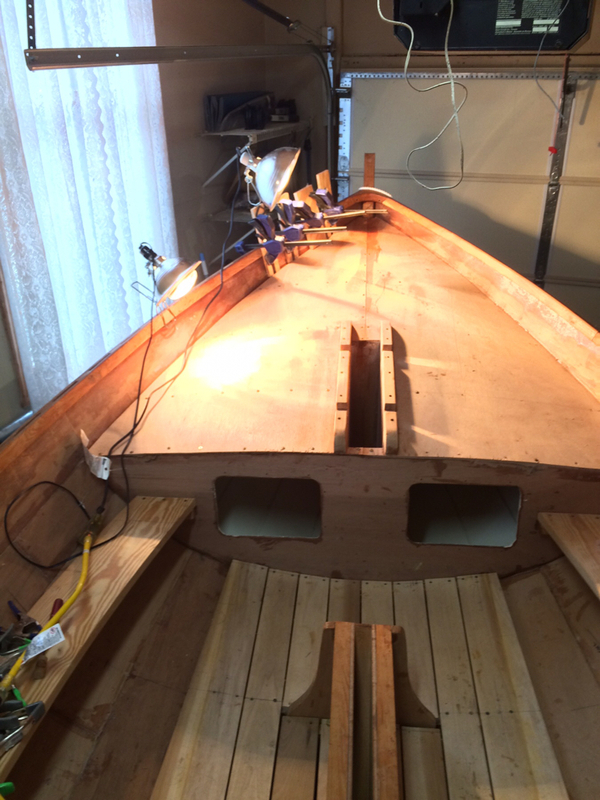 Just a little more progress, the port side foredeck and mast chock are now installed! 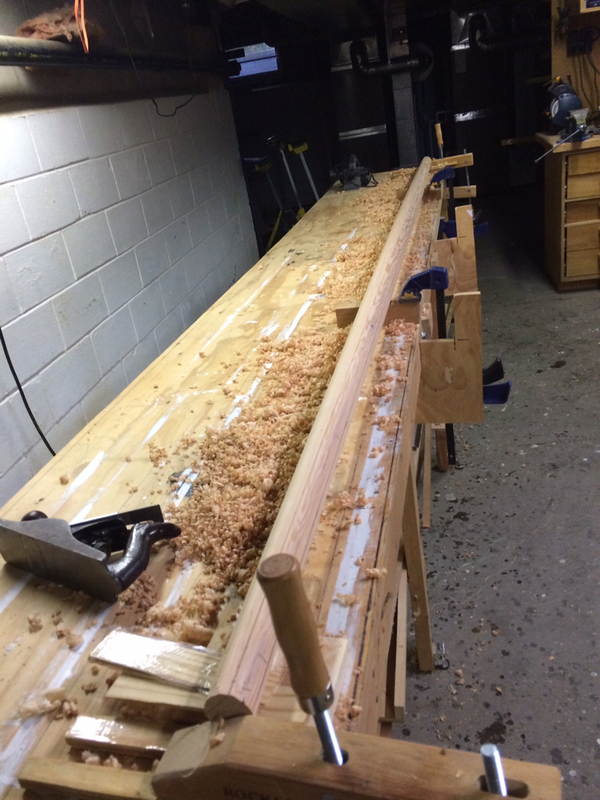 Had a little mishap with my plane jointer that got in the way for a couple of weeks. Payed a little too much attention to the piece I was working on and not enough to where my fingers were. Broke the “never do this rule” and paid the price. Finished up the black locust centerboard case cap and trim, these will not be epoxy glued but screwed with beding compound. They will be pulled back off and varnished. So far everything on this thread is mouthwateringly beautiful, except for the finger shot which made the hair on my neck stand on end. Can't wait to see your boat afloat, and hope the slightly short digit doesn't cause you too much grief. It's looking so great! I'm very sorry about your finger. That must have been a scary moment. Hope it heals well and doesn't slow you down too much. What bedding compound will you use? I'm planning on a removable cap for my CB case as well. Thanks for the positive comments about the boat and finger. 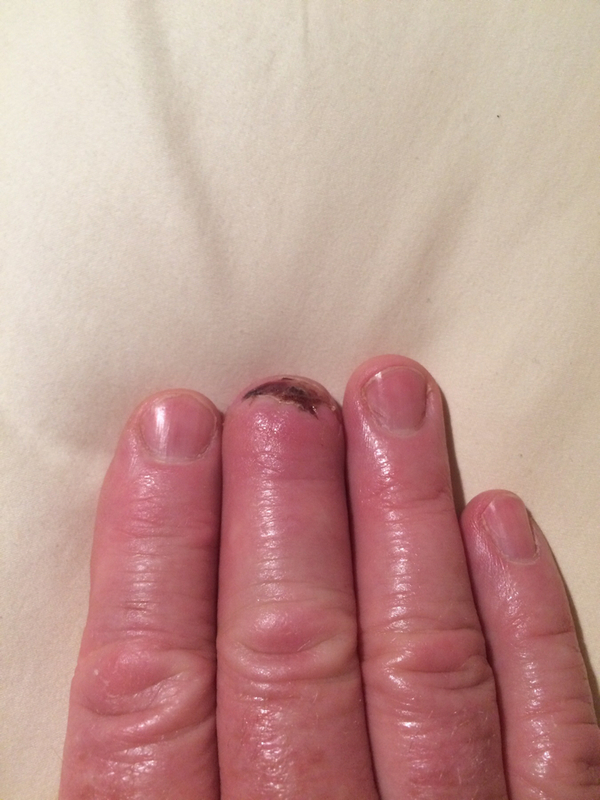 Finger is doing ok, it is still actually useful. Posted it as a don’t get distracted and make a stupid mistake like me! The boat will go splash sometime this summer - no hard date. Mike, I am going to use dolphinite to bed the capping pieces and for most other bedding jobs on the boat.